When seen from above Newgrange looks like a giant skull, the top part of the skull of a Bull with long horns. The circular form between its horns, the grass covered mound, almost certainly represents a large golden sun disc. 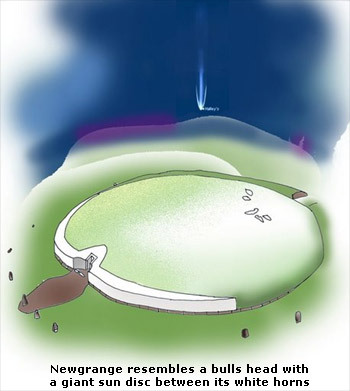 It is obvious that the builders of Newgrange constructed the temple in honour of the horned Bull of Heaven which I believe can be considered a metaphor for Halley's Comet. Little is known about the adoration of Halley's Comet in antiquity. The oldest written source that can be granted to the apparition of Halley's Comet is from 240 BC and was recorded by Chinese astronomers. Also the Babylonian astronomers where interested in the return and visibility of Halley's Comet as a Babylonian tablet dated to 164 BC shows. If Comet Halley was seen prior to 240 BC, the age of Halley's Comet has been calculated (Ref.1) on about 174,570 years, than we might expect that civilisations used metaphors for this strange and remarkable astronomical, once in a lifetime, event. I find it hard to believe that Edmond Halley was the first astronomer who noticed the periodicity of our greatest and most famous comet. If Halley's Comet is, as been suggested by David W. Hughes, returning for about nearly 175,000 years and finds its way around the sun, of which we are not sure, than we might suspect the enormous impact this comet must have had on the consciousness of man. We must understand that a return of Halley's Comet can be seen by the naked eye sometimes for a few days but often for several weeks up to several months. And when its huge tails are visible around sunrise and around sunset than we can hardly imagine how impressive these weeks must have been for the common man. So it would, in my opinion, make sense, if our ancestors kept astronomical records of each apparition of Halley's Comet. In the time Newgrange was constructed, after the perihelion passage of Halley's Comet in December 3099 BC, as we will see, we might expect the time of the orbits of the five planets (Mercury, Venus, Mars, Saturn and Jupiter) were known, circling around the earth, as the moon and the sun did in these days. Man experienced total and fractional sun eclipses but eclipses occur regional and last only for a few minutes. From the fact that around about 3100 BC many temples where erected, not only in Newgrange but also in Egypt (Hierakonpolis), in England (Stonehenge), in Malta (Tarxien temple) and the Sumerian White Temple, we might expect that something special happened that could be seen in these lands. Halley's Comet is the only serious candidate for this event for it can be seen, in the vicinity of the sun, all over the world and on the same day. 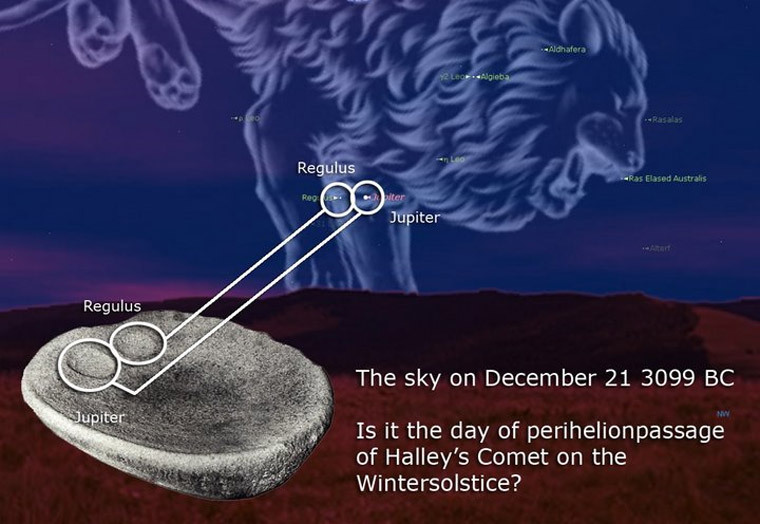 It must have been a very special day as well so we can expect that the visibility of Halley's Comet is related to the Winter Solstice of the year 3099 BC. This is a very important conclusion because we can easily check if an archaeological monument is related to the apparition of Halley's Comet if the day of the penetration of light into the holiest of the holy is known. For example: it is known that in Abu Simbel the sunlight penetrates the temple around February 20 and on a day in the autumn. I found that, using the Table of perihelion passages of Comet Halley composed by astronomer Joseph L. Brady, only in 1219 BC the comet had its perihelion passage on February 20. This year is within the life of its (supposed) constructor: the famous pharaoh Ramses II (Ramses the Great). If Abu Simbel has had a relation with an apparition of Halley's Comet why not Newgrange as well? 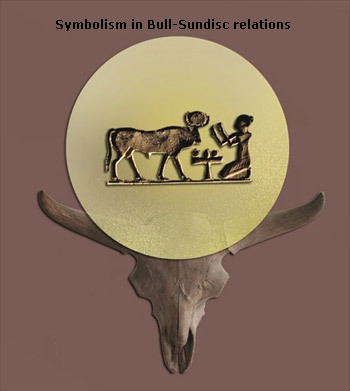 The symbol of the Sun disc between the Bull's horns has had a strong symbolic meaning in Egypt and was related to the bullgod Apis. Is it possible to calculate Halley's Comet returns back in time? Of course it would be great if we can be sure that 3099 BC was in fact a year of Comet Halley's return. Thanks to the excellent work of Joseph L. Brady, who calculated perihelion passages of Halley's Comet as far back in time as 2647 BC there only remains a time-gap of 453 years between 2647 BC and 3100 BC. We might expect a relation between 3100 BC and 2647 BC as 453 years/75.9 years= about close to 6 returns of Comet Halley. 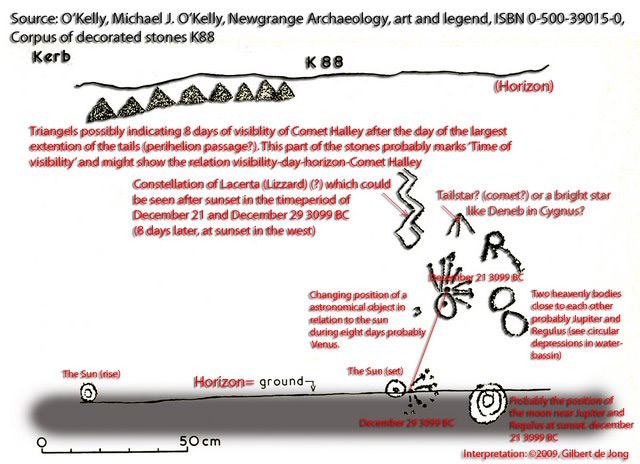 Brady states, in his underestimated publication on Comet Halley's perihelion dates, that his calculations can be considered more precise than archaeological records might require. But between his oldest perihelion passage date and the construction of Newgrange is still a period of 453 years which equals 6 returns of the comet. How can we be sure Halley's Comet returned around 3100 BC and in what year 3099 BC, 3101 BC, 3098 BC or in any other year close to 3100 BC? A secret knowledge comes to light if we record the position of planets on the day of perihelion passages of Halley's Comet. Between 2647 BC and 393 BC, I found the surprising fact that on every third return of Halley's Comet planet Jupiter could be found in the constellation of Leo. This fact can easily be checked using astronomy software, as I used Starry Night Pro 6.0 and Brady's perihelion dates to look for planetary positions. So what I did is detecting the position of Jupiter after 3 times 75.9 years. Jupiter is a slow moving planet. It takes Jupiter 11.86 years to travel around the sun so in twelve years it will be about one year in the constellation of Leo. (Because we have twelve zodiac-constellations we can say Jupiter resides about one year in each constellation). This is the year I was looking for because Jupiter was in Leo on Comet Halley's return in 2647 BC, in 2873 BC and in 3099 BC. The constructors of Newgrange marked the day of the Winter Solstice by allowing the penetration of the sunlight on this special day lighten up the interior of this temple. They probably constructed Newgrange to show us that, in the past, in 3099 BC, Halley's Comet had its perihelion passage on an unique day: the winter solstice in December. This might well explain why in other countries as well the construction of temples took a great flight. and 3099BC in relation to the position of Planet Jupiter in the constellation of Leo. Besides Newgrange we can find two older megalithic monuments in the Boyne Valley. Extrapolation of the Leo/Jupiter/Comet Halley correlation show a surprising and possible relation to these other two ancient megalithic sites. Dowth is supposed to be constructed around 3300 BC and Knowth around 3500 BC. For the latter it also been suggested that it is younger than Newgrange. It seems as if the Irish people, or whoever came to Ireland to construct these monuments, knew that Jupiter was related to a fixed pattern of stars ('Leo') on every third return of Halley's Comet. 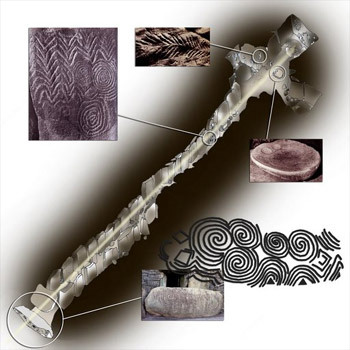 The discovery of this ancient and probably secret and sacred knowledge might be related to the origin and meaning of the double spiral symbol, that can be found, for instance, on the Newgrange entrance stone. If the interior of Newgrange indeed is related to Halley's Comet than the symbolism of the double spiral should be too. Being able to predict the next appearance of Halley's Comet might be considered one of the greatest achievement of humankind on astronomy. Apparently the Irish people living in the Valley of the Boyne might have been able to predict its next return within the timeframe of one year. But who told them the secret? Did they discover the relation between Jupiter and Halley's Comet themselves? Consider the following: The daily rotation of Earth creates the appearance of rings around the pole as we can see on the image on the Wikipedia article. But they represent of course only the non-moving stars. When a comet is moving in the direction of the Pole star, and we might observe this phenomenon in the evening and night, we might notice a spiral form instead of a ring. We might watch the comet approaching the pole for several days and we will notice the comet drawing smaller circles each day: spiral wise. After the comet passes the pole the circles will become larger each day. The result: two intertwined spiral forms: the double spiral. It is a fact that Halley's Comet can pass over (both) poles of the earth by Nasa so the comet really can draw spirals in the air. There is only one place on earth where exactly the same double spiral form can be found in a strong astronomical context: the Nazca-Palpa dessert. In the Nazca-Palpa dessert, Peru, huge geoglyphs and lines have been found with an unknown function. One of theses geoglyphs is a double spiral form, very similar to the double spiral forms on the entrance stone of Newgrange. In Newgrange the double spiral has been used as a a symbol (Newgrange is not an observatory) while in Nasca it seems to be related to astronomy and record keeping. The jig saw lines proof the ancient astronomers were looking at the spots on the horizon where the comet passed when it drew its circles. In Ireland the symbol of the double spiral was used in the construction of the temple of Newgrange. If the Irish 'discovered' the double spiral form than we might wonder if Irish astronomers, or other old world astronomers from the northern hemisphere, were also responsible for the double spiral forms in Nazca! If this is the case than we might expect that some of the legends in South America show a 'fish' (salmon) relation with Newgrange. 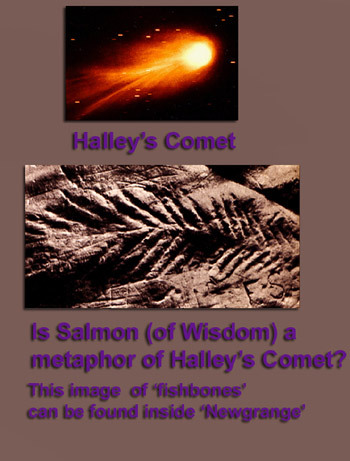 The image of what seem to represent the bones of a fish, often called 'a fern', in the Newgrange-temple can be considered a metaphor for the structure of the tail(s) of Comet Halley. This metaphor seems to be specially related to the site of Newgrange for, in the past, before re-construction, rainwater was allowed to enter the temple from the roof, probably has a symbol of fertility as the salmon mates in the river Boyne. The rainwater that fell into the large stone bowl has been probably used as a mirror reflecting certain stars or planets from a special viewpoint (Ref.2). Was the point where Comet Halley was last seen marked by this particular spot? The site of Nazca might also in other aspects be related to Ireland. 'Nasca' (Spanish: Nacer) can be translated as 'being born' or 'to be born'. In ancient literature it has been known as 'Nanasca' or 'Lanasca'. Is the Newgrange metaphorical fish, the salmon of knowledge, related to the site of Nasca? When I visited Nasca in 1998 I rented a plane for about an hour. I flew around and took photographs of famous Nasca petroglyphs as well as appeared to be unknown petroglyphs. One of the petroglyphs seemed to resemble the petroglyph of the fishbone-structure that can be noticed in the interior on the Newgrange temple. 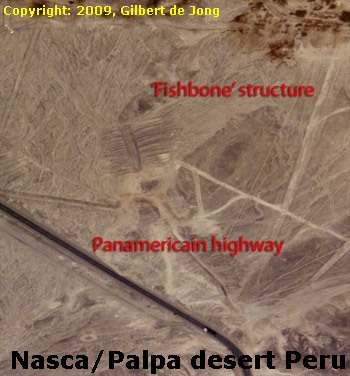 It might be a strange coincidence that 'nasca' in some occasions can be related to ancient Irish place names. I do not know for sure if there is a physical relation between Ireland and the place of Nasca although I do suspect some relation or relations. It might be possible that, because of the foundation of Caral, the largest (Peruvian) city of the Americas that Halley worship, as the returning soul of a King, might have been introduced to the South Americans prior to its apparition of 2647 BC. If so than the (Phoenician) priests, from the old world, might have looked upon Nazca, as being a large and unique school board where long term calculations on planetary positions in relation of the apparition of Comet Halley, on the southern hemisphere, could be made. The Phoenicians have been considered the world's oldest seafaring nation and they can be hold responsible for a widespread of religious teachings from very early times on. Phoenicians, according Herodote started to quarrel along the seacoasts and they also seem to have had great knowledge on mathematics, astronomy and navigating. Phoenicians might have introduced the Bull Worship in Ireland and might have introduced the symbol of the Bullhorns and the Sun disc in Ireland. The construction of Newgrange as I have suggested was probably based on the apparition of Halley's Comet in 3099 BC when it might have its perihelion passage, with its tail looking like the bones of a fish on December 21. The sky on December 21st shows Regulus ('Little King') and Jupiter ('King of the Gods') parallel. marking the change in position of Venus at sunset in the West. 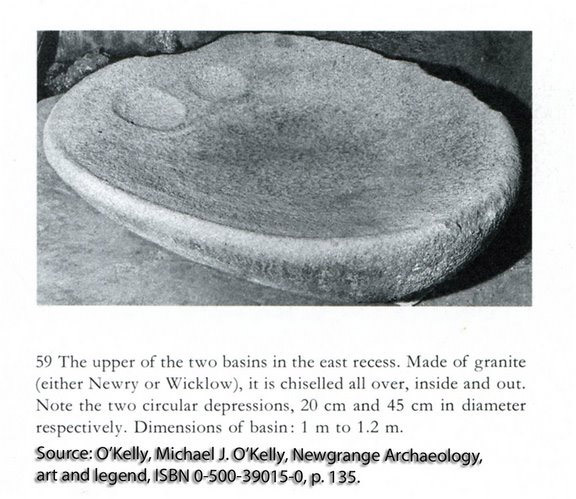 Two impressions on the ceremonial water bowl in the chamber at Newgrange probably show the position of Jupiter (left) and Regulus (right) that were visible at the Winter Solstice of 3099 BC in the year of Comet Halley's return. 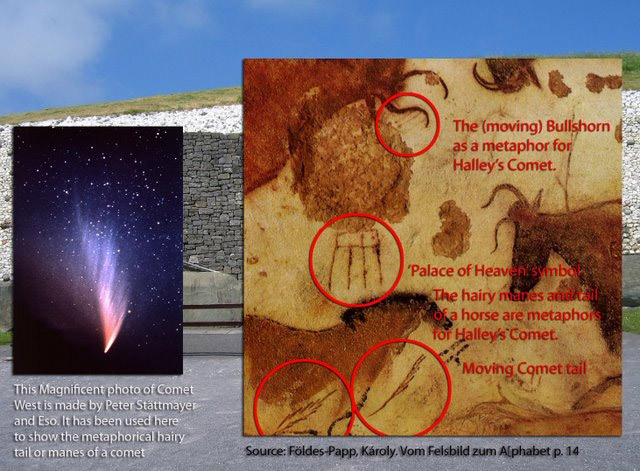 Is Newgrange related to apparitions of Halley's Comet? It might, for already in the Lascaux Cave, France (14.000 BC) we can observe a very early relation between the Bull metaphor, a comet tail and a symbol for the p(a)lace of Heaven. Where the comets are!